Marine Le Pen backs off her predictions of a U.S.-like global revolt. PARIS — In the early hours of Nov. 9, Marine Le Pen was the first foreign politician to congratulate the new U.S. president-elect. But a month before the first round of the French elections, Le Pen’s tone has markedly changed: no more President Trump – at least not for now. Le Pen, almost certain to qualify for the second and final round of the elections, seems to be keeping her distance from her compadre. The word “Trump” rarely figures in her speeches and rallies these days, and when she squared off against France’s four other presidential candidates in the campaign’s first televised debate March 20, she avoided mentioning him in any policy discussion, despite ample opportunities to do so. On a broader level, after the defeat of Geert Wilders in the Dutch elections last month, Le Pen and her aides even have shied away from their frequent forecasts of the populist wave soon to cascade through France and carry them to power. If she wins, she now says, it will be because of France and the French – not because of a seismic shift in geopolitics and the tailwind it would bring. “I’m counting on you to carry out with me the battle for France!” she said Thursday, speaking at an agricultural fair in rural Brittany. 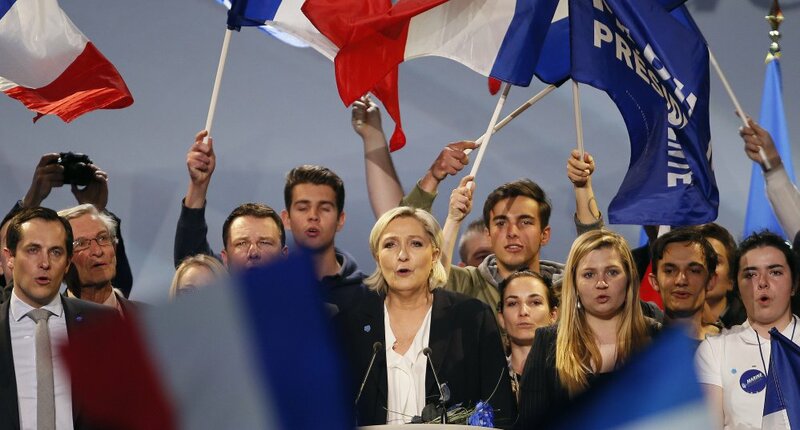 “We have to put France back in order!” she said Monday in a speech in the Vendee. “I will engage France on the path of economic patriotism – for our small business, for our farms,” she said Sunday in Lille. The shift, analysts say, mirrors her recent softening of her famously hard-line stances on both the European Union and the euro. Le Pen has campaigned largely by advocating for the removal of France from both, but she now says she would hold referendums on each – especially after recent opinion polls have reiterated the popularity of the currency among ordinary French voters. The same now applies to Trump. “It’s difficult for Le Pen to use Trump, when she knows that so many French disapprove of him,” said Dominique Moïsi, a political scientist and co-founder of the Paris-based French Institute for International Relations. According to opinion polls, nearly 8 in 10 French voters harbor strongly negative views of the U.S. president, who has repeatedly insisted – sometimes through the commentaries of a mysterious, unidentified friend named “Jim” – that “Paris is no longer Paris” and that “France is no longer France” in the wake of the terrorist attacks that have claimed 230 lives here since the beginning of 2015. In France, where even fringe politicians are expected to dazzle with wit and erudition, the brash and often unscripted public persona of the U.S. president has become something of a liability for his chief French ally, who was spotted in the basement cafeteria of Trump Tower on an impromptu visit in January. The substance of Trump’s ideas – or versions of them – does remain popular with a number of French voters, who favor a return of national sovereignty, immigration bans and rapprochement with President Vladimir Putin’s Russia. These are all pillars of Le Pen’s platform, and she is expected to garner at least 40 percent of the vote, according to the latest polls. There is also the issue of the anti-Americanism at the heart of the National Front, which for decades has railed against “American imperialism” abroad and its principal local manifestation – the European Union. If Trump’s isolationist rhetoric represents a departure from decades of U.S. foreign policy, he is still an American president in the eyes of a party long in favor of France abandoning its ties with the United States for a new relationship with Russia. If she rarely mentions Trump anymore, Le Pen – who met with Putin in Moscow last month – has no qualms about reminding her supporters at every turn of her plans to deliver on that Russia promise. In her recent speech in Lille, days after returning from Russia, she called Putin a “real statesman” engaged in the same “fight against terrorism” as France.